How to Improve Your Garden’s Reticulation – Looking Good Landscaping ""
If you’re a WA-homeowner, chances are you have a garden reticulation system installed – most WA-homeowners do, and it turns out we’re onto something. If you haven’t yet hopped on this superior lawn care train or if you think your garden reticulation system could be better – read on. Once you’ve had garden reticulation installed and ready-to-go, there’ll be no more hassle of having to get the hose out, or move the sprinkler around so that every bit in the garden ‘gets a turn.’ A garden reticulation system automatically switches itself on, waters the lawn, and then turns itself off, bringing ease and efficiency back to garden irrigation – without you lifting a finger. Even irrigation is another benefit of a water reticulation system, with a pre-determined time ensuring no part of the yard gets too much, or too little love. If you’re admittedly lazy or forgetful when it comes to watering the garden, water reticulation is your new best friend – especially when you’ve invested in a dream garden landscape. It would be a shame for your front and backyard to look limp and lack lustre only because you continually forget to turn the sprinklers on. 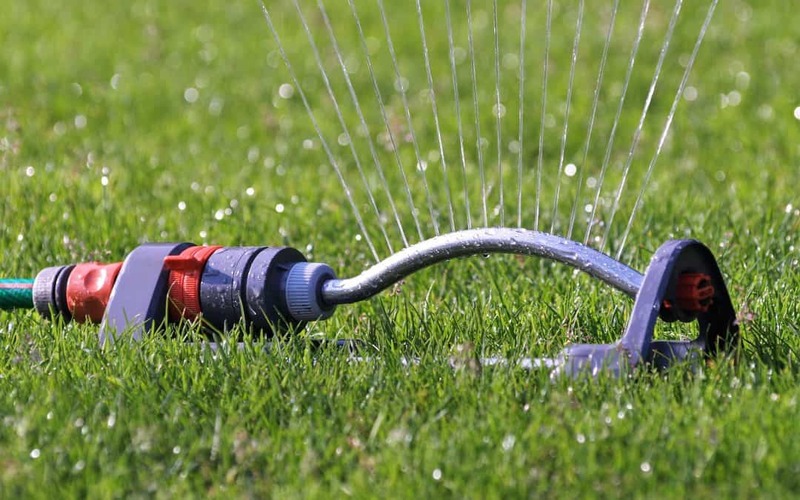 If your garden already has a reticulation system but its sprinkler pressure seems a bit half-hearted, a broken pipe or insufficient system design may be the reason. Oversized nozzles could also be to blame. More details on poor sprinkler pressure here. A typical garden reticulation system is made up of a plastic pipe network that run underground from the mains, extending throughout the landscape. These extensions are typically divided into six or eight circuits, each containing several sprinklers; the type of sprinkler will vary according to the grass or plant it intends to water. A valve enables a circuit to be automatically turned on (open) or off. When the valve switches on, water will flow through that circuit so that the sprinklers open. Who’s responsible for all this? ‘The Controller’, an automated electronic controller box that sends low-voltage electricity to each station. This electricity prompts the valves to open for a specific set time. When setting a specific watering time, we stick to the recommended 20 minutes or less over the summer, and weather depending, about 10 minutes over autumn and spring. Due to the drought, Perth currently has a total watering ban during the winter. In all other seasons, watering is permitted twice a week. We’ll configure it all for you so you don’t have to worry. While a simple sprinkler or old-school hose might seem like the easiest way to water the garden, these options can be detrimental to the landscape. Servicing areas across Mandurah, Baldivis and Rockingham, contact us at Looking Good Landscapes for a consultation on how garden reticulation would best work in your garden. No irrigation system will look after your lawn like a professionally installed reticulation system.